2. Add the fennel seeds, cloves, bay leaves and cinnamon. 4. After a minute, add onions, green chillies and curry leaves. 5. Saute for a few minutes until onions turn golden brown. 6. Add ginger garlic paste and saute over low flame. 7. Add red chilli powder, coriander powder and turmeric powder. 8. Cook for 5 minutes over medium heat. 9. Add chopped tomatoes and salt. 10. Mix well and cook for 4 to 5 minutes. 11. Add the garam masala powder and cook for 2 to 3 minutes. 12. Add the mutton pieces and cook over medium heat for 10 minutes, stirring from time to time. 13. Transfer the contents of pan into a pressure cooker. 14. Add 4 to 6 cups of water and pressure cook for 20 minutes. 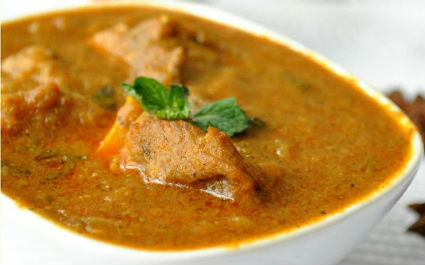 Feel free to comment or share your thoughts on this Kerala Mutton Curry Recipe from Awesome Cuisine.